The Padilla decision is here. And whadayaknow, Stephen Reinhardt thinks Guantanamo guys have habeas rights, which you can read about here. Cover story on Kozinski here (you must, I repeat, must check out the picture. Not too many federal judges willing to do that! 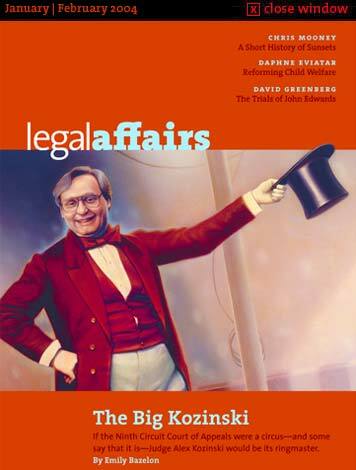 ), along with other good stuff in Legal Affairs magazine. Laurence Tribe gets angry here (all those recent high profile appellate loses must be getting to him). The D.C. Circuit decision allowing ISP's to refrain from giving the info of mp3 traders is here. And last but not least, Richard Epstein wrote an interesting amicus brief for the pledge case here.